The fast food giant says earnings fell in the first quarter. Are Americans losing their appetite for McDonald's? The fast-food giant reported that sales in the United States continue to decline. Its first-quarter earnings fell well short of analysts' expectations. McDonald's blamed bad weather for its disappointing results, but it also said "challenging industry dynamics" are eating into profits. Rival fast-food chains, including regional players like Sonic and Jack in the Box (JACK), are starting to steal some of the shine from McDonald's Golden Arches. The competition has been particularly fierce at breakfast time, when McDonald's makes about 25% of its sales. Taco Bell, which is owned by Yum! Brands (YUM), recently launched a Waffle Taco with great fanfare. McDonald's responded by offering free coffee in March. McDonald's has been focusing on coffee in the past few years as Dunkin' Donuts (DNKN) and Starbucks (SBUX) have ramped up their food offerings. They now have an extensive offering of iced coffees, for example. "Breakfast was the piece of McDonald's business that had held up the best, and it's now facing potential threats" said Sara Senatore, an analyst at Sanford Bernstein & Co. The Golden Arches has also been struggling to innovate as rival chains launch new products aimed at younger consumers, a key demographic for the fast-food industry. KFC, for example, recently brought back its Double Down bread free chicken sandwich, which has somewhat of a cult following. "Its competitors have gotten better, but McDonald's has stayed the same," said Lynn Collier, an analyst at Sterne Agee. Chief executive Don Thompson addressed concerns about McDonald's declining market share in a conference call with analysts. Thompson said the company is unveiling new marketing campaigns to reconnect with customers, but he acknowledged that the initiatives do not represent "a sliver bullet" and that it will take time to turn the sales trends around. McDonald's, he added, is "thoughtfully evolving our approach to remain relevant." Still, investors seemed to take the results in stride. McDonald's (MCD) shares were flat in early trading. McDonald's said it expects global sales to improve in April as the weather in the United States returns to normal. "The outlook is trumping the fact that they missed earnings," said Collier. Investors were also encouraged by McDonald's sales growth in Europe, which accounts for 35% of its overall revenue, notes Jack Russo, an analyst at Edward Jones. And McDonald's reported "solid" sales growth in China. But the company's core market remains under pressure. McDonald's said sales at U.S. stores open at least one year were down 1.7% in the first quarter. Earnings in the quarter fell 4% to $1.21 per share. Analysts surveyed by Thomson Reuters had predicted $1.24 per share. Revenue increased 1% to $6.7 billion, which was in line with expectations. 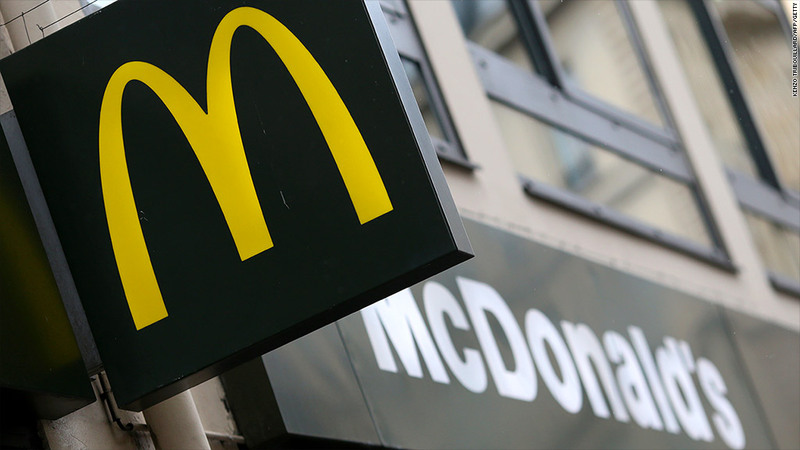 McDonald's had signaled that 2014 will be a tough year, with increased competition, rising commodity prices and higher costs related to store renovations. The company has benefited recently as investors have rotated money out of more risky assets into stocks that are considered stable. "Generally speaking, the market is willing to give McDonald's a pass on what were not great results in the absolute," said Senatore. "The market is looking for stability, so as long as things aren't getting worse, that should be enough for a company like McDonald's."